Neil Greenbaum and his three sons had a great day on the water for Father’s Day. The stripers were incredibly aggressive hitting chunk bait’s, and weighted and un-weighted live bunker. The action was almost non-stop in the early morning. Thankfully the bluefish are still moving in and keep intensifying the fishing by making the bass alot more active. 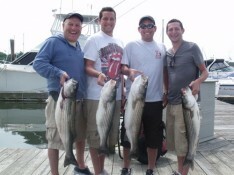 Long Island Fishing Charters - Spend a morning, afternoon or evening, with Capt Joby Vinarski (516-502-8837) or Captain Andy LoCascio (516-978-1634), host of the hit TV show Northeast Angling or some of the Northeast's finest and most experienced captains. Fish or just cruise the protected western Long Island Sound waters from Manhattan's East River to Connecticut. Sharpen your skills and learn about the techniques, tactics and gear used to catch the big fish. No prior fishing or boating experience is necessary! Now booking SPRING STRIPERS!